The crisis in the US coal industry has claimed its biggest victim yet as Peabody Energy (NYSE:BTU), the world’s largest privately owned coal producer, filed for bankruptcy protection. In its filing, the St. Louis-based company which traces its history back to 1883 listed $10.1 billion in debt, mostly due to the effects of dramatically low coal prices and falling demand from China. Shares in the miner have been suspended, but all of Peabody’s mines and offices are continuing to operate and are expected to continue doing so for the duration of the process, the firm said in a statement. Peabody’s bankruptcy filing is one of the largest in the metals and energy sector since commodity prices began to fall in the middle of 2014. The move by Peabody, the US largest coal miner, follows on the heels of similar actions by Arch Coal, Alpha Natural Resources, Patriot Coal Corp. and Walter Energy. In its bankruptcy filing, the company also said it has also shelved plans to sell assets in New Mexico and Colorado after the buyer wasn’t able to complete the deal. In March, Peabody delayed interest-rate payments on two loans and said it may not have sufficient liquidity to sustain operations, warning of a possible chapter 11 filing. With 29 mines the US and Australia and operations in India, China, Germany and elsewhere, the company sold 213 million tonnes of coal last year and has 7.5 billion tonnes of coal reserves. 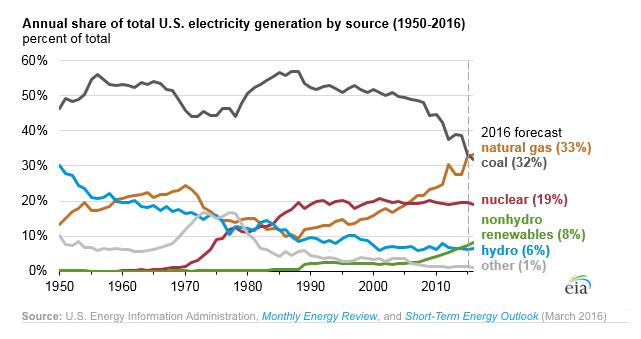 Coal miners in the US have been particularly hard hit by power plants substituting with natural gas. According to a report by the US Energy Information Administration 2016 will be the first year that natural gas overtakes coal as the largest energy source in the US. Between 2000 and 2008, coal was significantly less expensive than natural gas, and coal supplied about 50% of total US generation, but that will fall to less than a third in 2016. US coal production fell to 900 million short tons in 2015, according to data from the Energy Information Administration, a 10% decline on the previous year.